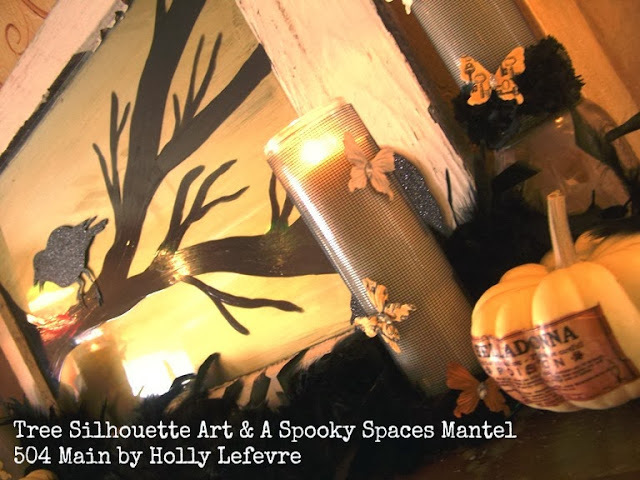 and create a "Spooky Space." DIY Tree Silhouette Art & Seasonal Decor. I was so excited and so inspired. 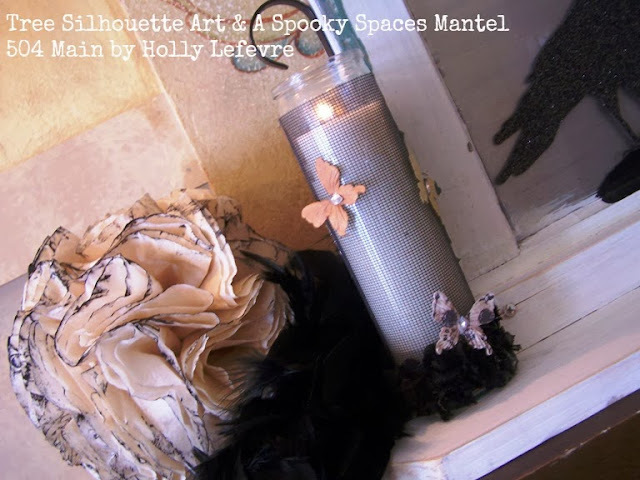 Jo-Ann Fabric and Craft Stores #spookyspaces campaign! It was so fun to Celebrate the Season with Jo-Ann. 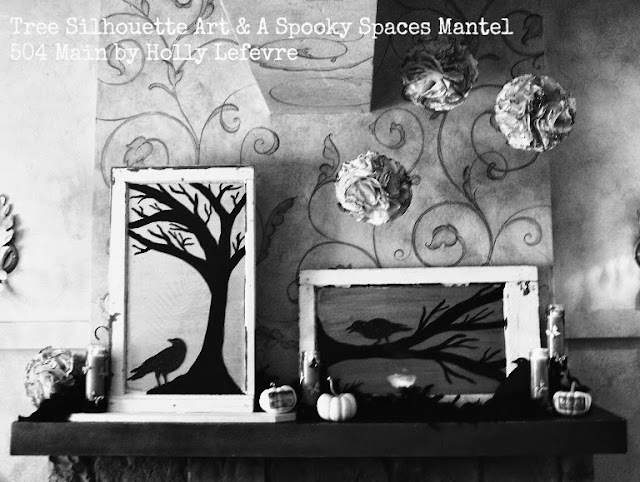 the Tree Silhouette Window Art. I bought my supplies at Jo-Ann Fabric and Craft Stores! Wash the window/glass and/or rub with rubbing alcohol to ensure the surface is clean and free of oils and dirt. I started with this window I had been using to display jewelry. 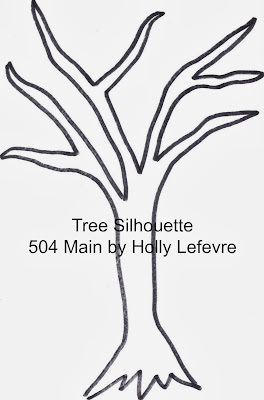 Decide on the size and enlarge if necessary, then print out the Tree Silhouette. 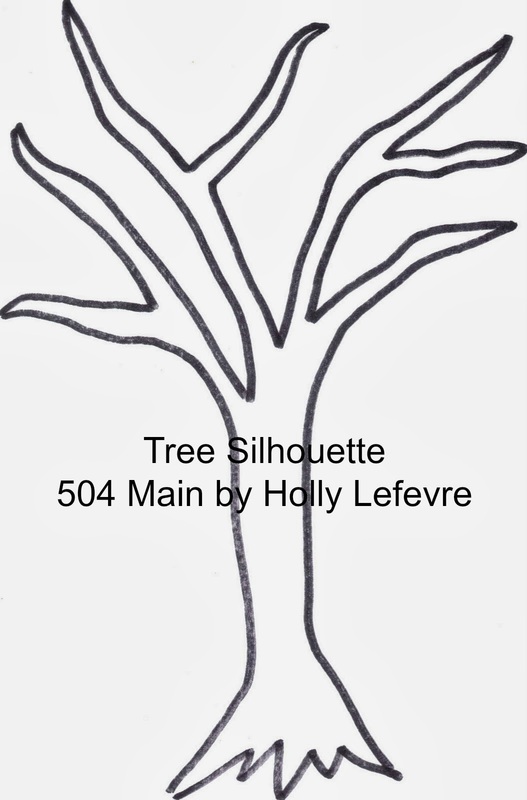 Trace your tree silhouette on the FRONT of the glass. 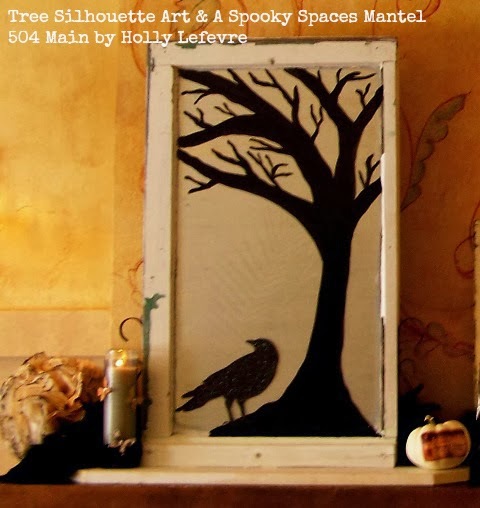 I used the template as a guide and free-handed the tree silhouette on the front of the glass, slightly off center. A) Place the outline on the BACK of your window/glass. Tape it to secure, flip it back over, and outline (on the front) in sharpie. B) Print out the silhouette and enlarge as necessary. Then cut it out, place it on the front, and trace around the silhouette. Flip the window over so the back is facing up. Use the foam brush and paint (I painted horizontally) the Silver (or your color choice) Gloss Enamels over the entire surface (Use painters tape if you need to keep the paint off the frame). Let dry. Use 2 coats, letting dry completely between coats. NOTE: If you are using a window or framed glass you may be able to flip the window over (back and forth) to work on both sides simultaneously because the frame will keep the glass from resting on the work surface. While the first coat on the back dries, on the FRONT use the Black Gloss Enamels and a combination of a foam brush and thinner brush to paint the silhouette and inside of the tree black. Use the smaller tipped brush and add smaller branches and twigs to the large tree outline. Let dry. Flip the window back over and do a second coat of the Silver Gloss Enamels on the back. This is not an opaque covering...it is meant to be light and semi transparent. 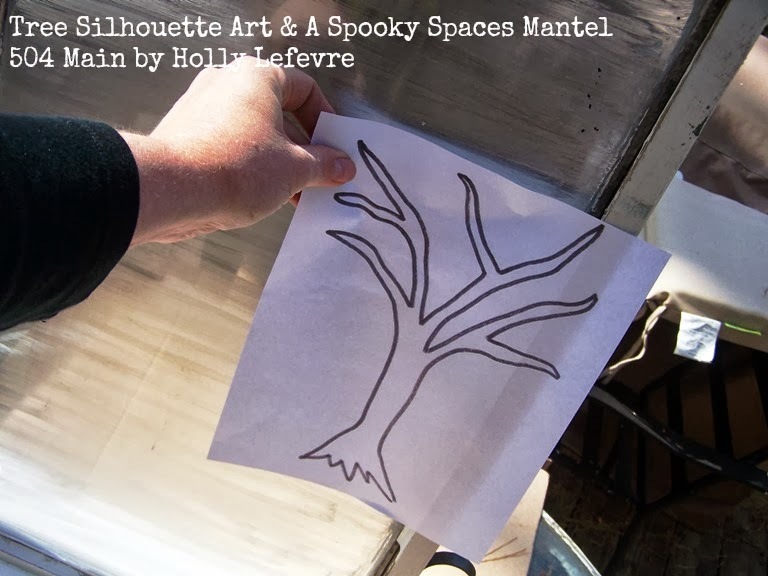 Flip the window back over and double check the tree silhouette, add or touch up the tree if necessary. Let dry. NOTE:Normally you would bake the Gloss Enamels, but it is a bit hard to get a window in the oven! The Gloss Enamels will air cure in 48 hours. Repeat the process for the second window. You can use the same tree silhouette or a new one. I designed this so that if you flipped both windows to be more vertical, they would look like trees, and if one is horizontal and one vertical, it looks like a tree and a branch. On the front, place the Martha Stewart Crows Silhouettes where you like. 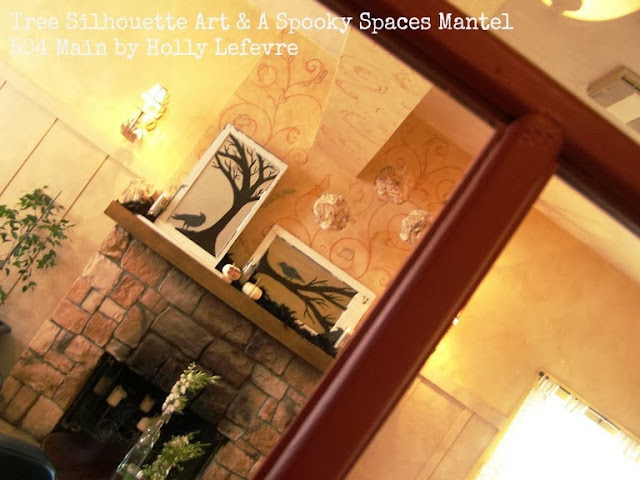 I finished off the mantel with the following (more tutorials to follow) elements. Again I shopped as Jo-Ann Fabric and Craft Stores. Candles wrapped in my secret weapon (ha!) and trimmed with organza rose trim and Engraver Butterflies (Mulberry Paper with accent). One black feather boa was used as-is...exactly as I purchased it from Jo-Ann, draped across the mantel to act as a unifying element. Coffee dyed coffee filters attached to Styrofoam balls, and accented with Distress Ink edges and Engraver Butterflies (Mulberry Paper with accent). And...here is a smaller version done on a picture frame. See there are options if you cannot find an old window! I love having my coffee here in the morning and enjoying my mantel design! 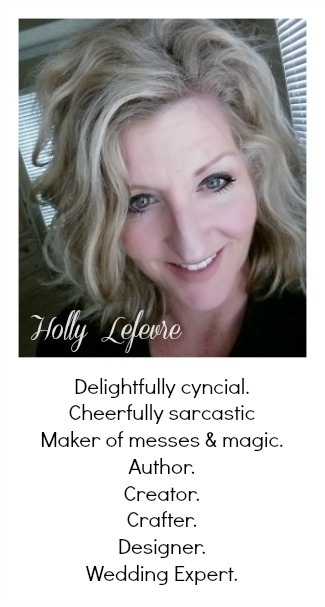 You can find out all sorts of inspiration in the Creativity Made Simple part of their website. Follow Jo-Ann on Facebook, Twitter, and Pinterest for more inspiration! Oh and lookie, lookie! Here is a 50% coupon for you! 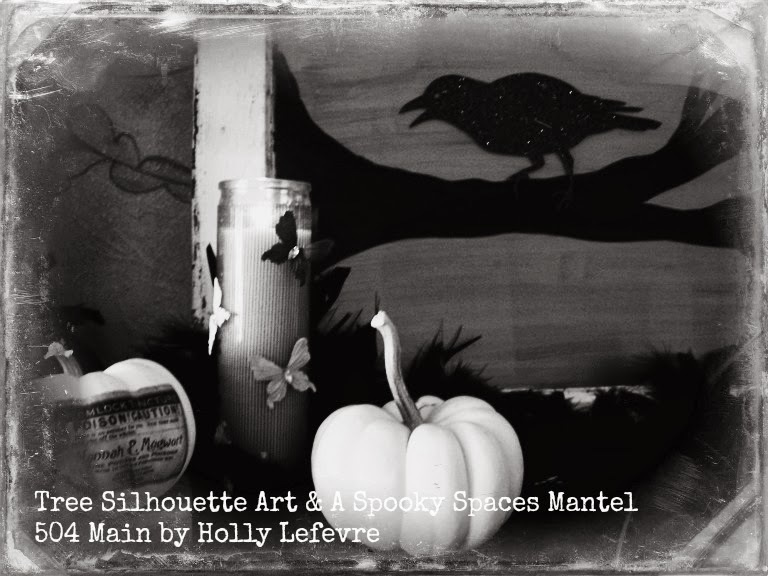 Have you finished decorating for Halloween? 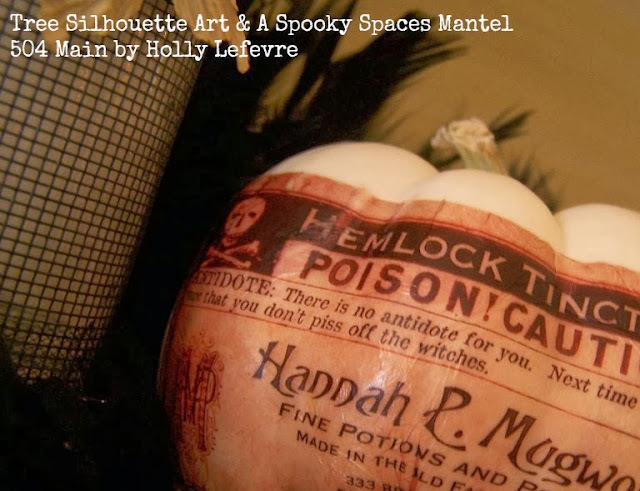 This post is written and created at 504 Main by Holly Lefevre disclosure: I received a giftcard to assist in purchasing supplies for this #spookyspace. Everything looks amazing on the coffee shop's mantel. What a great idea to share your decorating talents there! That tree window is just perfect. That looks amazing! And I love that you did it at the coffee shop! The really cool friend (you know who you are) gave me the perfect window for this! I am so doing it! This is awesome Holly. I love your tree!